An under-recognised cohort within Tasmania’s forest communities is identified, one that shares the social and cultural background of Timber Communities Australia’s constituency, but holding deeply antipathetic views toward current forest regimes. 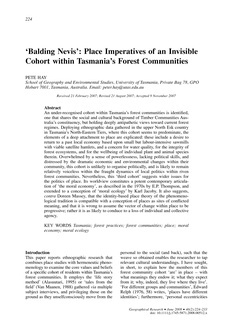 Deploying ethnographic data gathered in the upper North Esk country in Tasmania’s North-Eastern Tiers, where this cohort seems to predominate, the elements of a deep attachment to place are explicated: these include a desire to return to a past local economy based upon small but labour-intensive sawmills with viable satellite hamlets, and a concern for water quality, for the integrity of forest ecosystems, and for the wellbeing of individual plant and animal species therein. Overwhelmed by a sense of powerlessness, lacking political skills, and distressed by the dramatic economic and environmental changes within their community, this cohort is unlikely to organise politically, and is likely to remain relatively voiceless within the fraught dynamics of local politics within riven forest communities. Nevertheless, this ‘third cohort’ suggests wider issues for the politics of place. Its worldview constitutes a potent contemporary articulation of ‘the moral economy’, as described in the 1970s by E.P. Thompson, and extended to a conception of ‘moral ecology’ by Karl Jacoby. It also suggests, contra Doreen Massey, that the identity-based place theory of the phenomenological tradition is compatible with a conception of places as sites of conflicted meaning, and that it is wrong to assume the vector of change within place to be progressive; rather it is as likely to conduce to a loss of individual and collective agency.